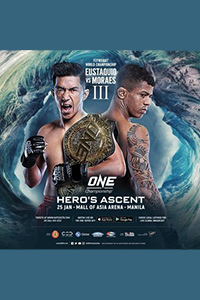 ONE Championship 88: Hero's Ascent took place January 25, 2019 at Mall of Asia Arena in Manila, Philippines. • Geje Eustaquio vs. Adriano Moraes 3 (FlyW Championship): Adriano Moraes defeats Geje Eustaquio via unanimous decision. • Danny Kingad vs. Tatsumitsu Wada: Danny Kingad defeats Tatsumitsu Wada via unanimous decision. • Reinier de Ridder vs. Rong Fan: Reinier de Ridder defeats Rong Fan via submission (D'Arce choke) at 1:51 of Round 1.